After members voted against taking further action in a consultative ballot held during November 2016 the union stood down its 2016 work to contract industrial action as well as our call to external examiners to boycott those duties. This does not mean that UCU accepts the imposed 1.1% pay uplift. Read more on the consultative ballot here. The latest offer from the employers included plans to tackle the gender pay gap and to deal with the problem of casual contracts and job insecurity for staff - key elements of the union's pay claim. However, it did not make an improvement on the 1.1% pay offer made by UCEA in April, which was just a 0.1% increase on the original 1% offer made in March. A special meeting of the Higher Education Committee (HEC) took place on 13 January to agree the next steps in the pay campaign 2016/17. HEC approved the development of a focused pay claim based on the principles of pay catch up and keep up. HEC also expressed a view that any final offer must ensure that changes to the government's approach to the living wage does not result in distributive bargaining by the employers to reduce the amount on offer to those above the living wage floors. The claim will be submitted during the first week in February. A series of regional/devolved nation pay briefings have been arranged for February to enable branches to discuss the wider pay campaign and feedback on any timetables for action. Branches have been asked to make every effort to participate in these briefings so as to inform the decisions of HEC. In advance of the UCEA board meeting on Wednesday 10 February 2016, Unite, UCU, GMB and EIS submitted the following key points of the national claim for this year's new JNCHES negotiations. To establish the Scottish sub-committee of new JNCHES as set out under the new JNCHES agreement. The main purpose of the sub-committee would be to deal with matters not currently being dealt with at the new JNCHES committee. Action to reduce the gender pay gap is part of this year's salary claim. In the run-up to International Women's Day on 8 March UCU highlighted the inequality facing those working in HE. The battle for fair pay involves everyone not just women and achieving transparent pay and promotion criteria in universities is a UCU priority. Find out what the gender gap is at your institution using our Rate for the Job tool here. The national employers representatives at UCEA made their opening offer in response to the joint HE trade union pay claim at the first negotiating meeting on 22 March. The next negotiations take place on 28 April. Following the unacceptable response to our 2016 pay claim UCU will now be balloting HE members for industrial action. Ballot papers will be posted on 14 April. The ballot will close on 4 May 2016. UCU and the other unions met the HE employers to press for a fair pay settlement. In response to evidence that the real value of salaries has fallen 14.5% since 2009, the employers were only prepared to increase their pay offer from 1% to 1.1%. UCU members working in higher education have voted in favour of strike action in UK universities in a row over pay. The vote follows a marginally improved offer of 1.1% from the employers, the Universities and Colleges Employers Association (UCEA), which the union has described as 'insulting'. UCU's higher education committee (HEC) will meet on Friday 6 May to consider the result. An announcement regarding the next steps of the campaign will be issued on Monday 9 May. You can view the full scrutineer's report here [159kb]. an instruction to members to work to contract with effect from 25 May 2016. Full guidance will be issued on what you should and should not do. The HEC has also agreed to make preparations for further action aimed at student admissions and at the setting and marking of students' work should the employers not improve their offer. UCU negotiators met with the employers' association, UCEA, this week in the hope of finding a solution to the current dispute amid growing anger over news that vice-chancellor pay rose by 6.1% last year. 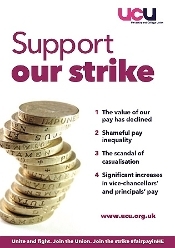 Regrettably UCEA made no improvement on the 1.1% pay offer to staff or on measures to address gender inequality and insecure contracts and the strike action will continue on 25 & 26 May as planned. More than 1,000 academics have already resigned from their roles as external examiners in universities across the UK, with thousands more expected to join them in coming weeks, the Guardian has reported. external examiners continue to resign their positions on exam boards. The consultation on the employers' latest offer closed on 11 November and you can see the full results here [27kb]. By a margin of 57% to 43% members voted not to undertake further industrial action at this time. By a margin of 52% to 48% members voted that the offer provided a sufficient basis for the union to begin 'detailed joint work aimed at tackling the gender pay gap and casualisation'. This means that UCU is now standing down the current work to contract industrial action as well as our call to external examiners to boycott those duties. It does not mean that UCU accepts the imposed 1.1% pay uplift. 'Over recent years the employers have failed to participate in our negotiating process in good faith, and as a result JNCHES has failed to make any real progress when it comes to making pay fairer and providing secure employment. 'Paul Bridge, UCU head of higher education, said in a message to members: 'The above voting margins are relatively close reflecting, in my view, both the uncertain times we are living through and a real scepticism among members about whether the employers at a UK level are serious about their offer of joint work to make pay fairer and jobs more secure. 'The truth is that our scepticism is justified. Over recent years the employer representatives at the University and College Employers Association (UCEA) have failed to participate in our negotiating process in good faith, and as a result the new joint negotiating committee for higher education staff (JNCHES) has failed to make any real progress when it comes to making pay fairer and providing secure employment. 'In 2016, women are still paid a little over 12% less than men. More than half of all teaching staff plus close to 70% of research staff do not have permanent contracts. Set against that the employers' offer to jointly examine and report on best practice in the sector, while useful, will not by itself win equal pay or a secure future for one single UCU member. 'So, while we will be entering these national discussions in a positive spirit we will also be taking nationally supported local action to hold every individual employer to account. 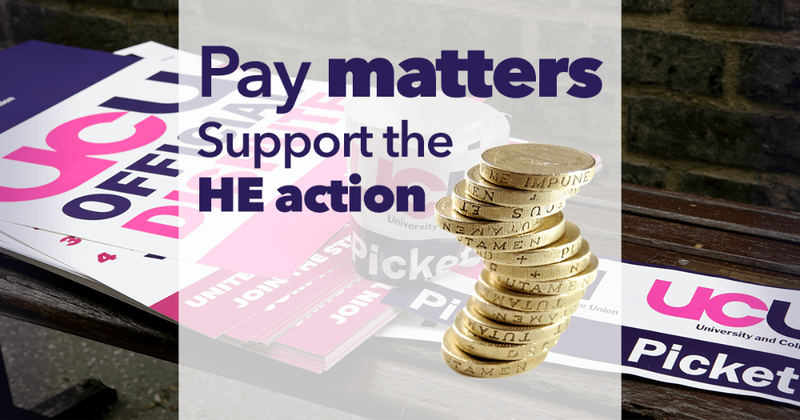 The Higher Education Committee has decided that nationally backed local claims on gender pay and the reduction of precarious employment should be made with every HE institution. 'Guidance and resources will be provided to your branch as will regional and national support to achieve these twin aims. However, what is most important and decisive is YOUR work to campaign and negotiate in your institution. We face a real challenge to get your employers to take the issues of fair pay and secure employment seriously, and it could be that in some cases we will need to take industrial action to concentrate your management's mind.